In the heart of Provence, in Lorgues, after a drive between legendary oaks and vineyards, the Domaine de Fauveris welcomes you for an unforgettable stay. 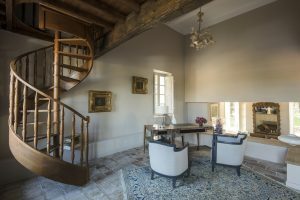 Built in 1850, this large country house, full of history, embodies the Provençal charm: brick-colored walls, large windows with green shutters opening onto a soothing nature. Gourmets and amateur cooks will probably appreciate the garden where aromatic herbs and seasonal vegetables are grown … and can be cooked to prepare our guests dishes with Mediterranean flavors. “La petite ferme”: chickens, pig, rabbits, complete this picture of greenery for the pleasure of children! For more than 160 years, the charm and authenticity have remained intact, sublimated by a neat, chic and contemporary decoration. Cozy intimate atmosphere for a soothing getaway and a timeless experience. The different objects and furnitures were chosen for their history and charm to reinforce the authenticity of the Domaine de Fauveris. 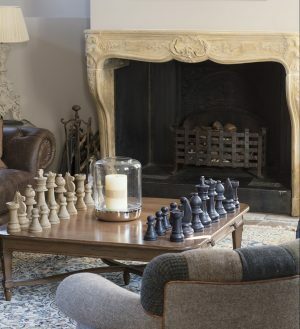 From the entrance, a lounge area welcomes you with a large library, board games and Chesterfield sofas in front of the fireplace. A quiet and relaxing place to talk, to read or simply to take time for yourself. On the other side of the room in the dining area, a wooden table with a foot recovered from an old sawmill is set. To start the day in a gentle way, a homemade breakfast awaits you as soon as you wake up. 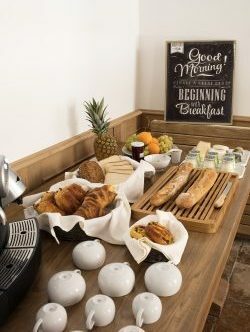 Breads, brioches and pastries, honey and jam, fresh fruit and juices will be on the table every morning. 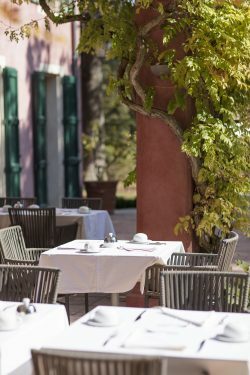 For lunch, fresh dishes: salad, bruschetta and dessert … These dishes are to be enjoyed by the pool, between two moments of bathing in summer, or by the fireplace during the autumn days – on request only.